Freshly ground spices make this extra special. Heat a large, deep frying pan and dry-fry the cumin and coriander seeds for about a minute, until they crackle and pop and release their aroma. Tip into a mortar and pestle or mini processor and grind to a fine powder. Return to the pan with the oil over a medium heat. Add the onions and garlic and fry for 10 minutes, stirring occasionally, until soft. Stir in the ginger and chilli and fry for a further 1 minute. Stir in the ground spices with the turmeric, tamarind paste and curry leaves. Pour in the coconut milk with 150ml water and bring gently to the boil. Reduce the heat and simmer gently for about 10 minutes. Cut the fish into large chunks of about 2-3cm and add with the prawns to the sauce. Cover and simmer very gently for about 5 minutes, until the prawns have turned pink and the fish is opaque. Stir occasionally (very gently, so the fish doesn’t break up too much). Season to taste with a little salt and stir in the coriander. 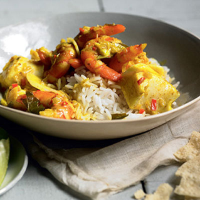 Serve with basmati rice and lime wedges.